I really don’t think anyone needs another way to get pasta into his or her diet, or peanut butter for that matter, but I can’t help myself here. I taught this Asian noodle salad in a class last year and I still haven’t tired of it. 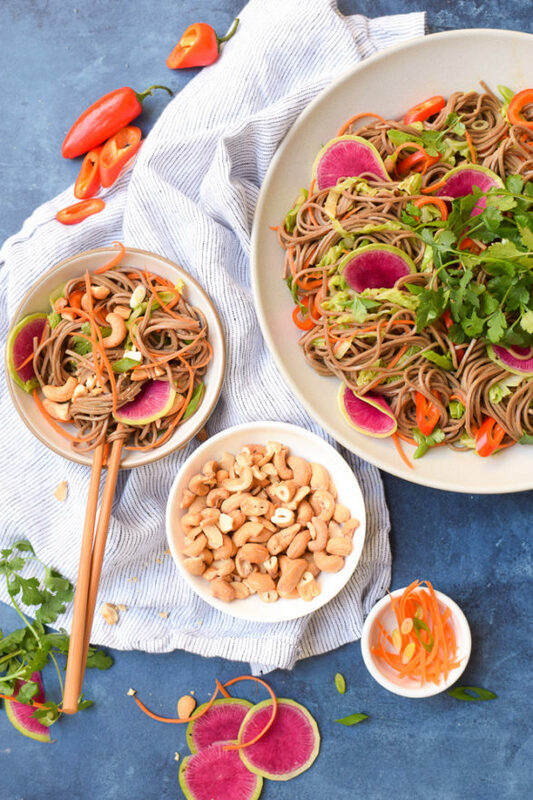 However, the pasta in this dish isn’t just your run-of-the-mill white flour spaghetti, which you certainly don’t need to eat any more of than you already do, but soba. Soba noodles are a Japanese pasta made with buckwheat. Most of the soba noodles I see in the markets are a wheat and buckwheat blend. But you can find ones made with 100% buckwheat, which is not a wheat at all, but a seed related to the rhubarb plant. Buckwheat also happens to be gluten-free, full of fiber and protein and contains a very cool compound called rutin which is helpful in lowering blood pressure. 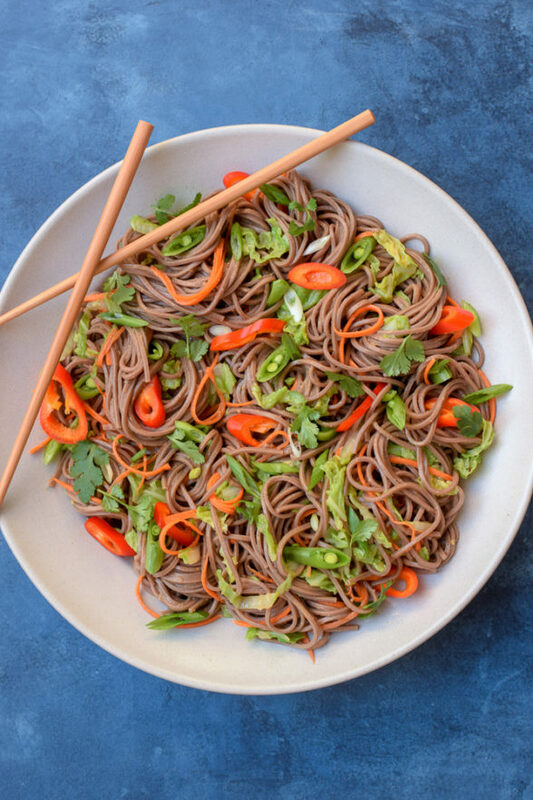 If you are trying to limit your gluten, I would not only give you a pat on the back, but I would like to encourage you to try the all-buckwheat noodles. Let me just forewarn you of a few things. Be prepared for a much nuttier, more assertive flavor than a traditional noodle, almost earthy. I will say, it works perfectly with a peanut sauce. It is quite a bit more expensive, too, almost $8.00 for 8 ounces. But more importantly, it demands a bit of babysitting when you’re cooking it. There’s a gumminess that leaches into the cooking water that can foam up and overflow all over your stovetop in an instant. One minute you’re stirring your pot diligently but you turn to your daughter to say, “how was your test today?” and the next minute you have a volcanic eruption that puts out the gas flame on your stove. Not to discourage you or anything, I’m just saying this could happen to you if you’re not paying attention. I love any recipe where I can work in a few more vegetables. Here I went the basic route with some Napa cabbage, a few shreds of purple cabbage and carrots because not much else is in season right now. But I have been know to add in raw red bell pepper strips and cucumber in the Summer and blanched asparagus and sliced raw sugar snap peas in the Spring (Mr. Picky’s favorite). If you’re like me and you don’t think cilantro tastes like soap, you can chop a few sprigs and add that, too. This makes a perfect dish to bring to a potluck since it can be made ahead of time and stays well at room temperature. Your lunchbox radar should be going off right now — perfect for school lunches provided your school allows peanut products. If you can’t eat peanuts, try this with sesame tahini or cashew butter instead. 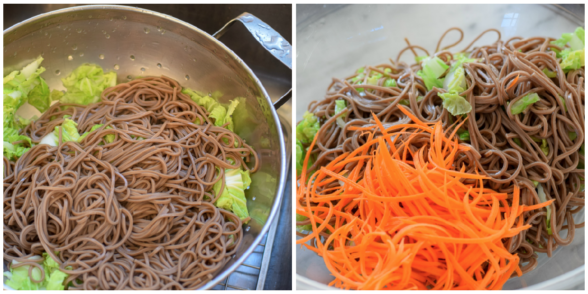 For a gluten-free version, again, look for 100% buckwheat noodles and wheat-free tamari instead of the shoyu. Chinese New Year is coming up on February 3rd, so look out for a few more posts before then to get you in the spirit! In a small bowl, whisk the olive oil, peanut butter, shoyu, sesame oil, rice vinegar, maple syrup, fresh ginger and red pepper flakes. Set aside. Place the shredded cabbage in a colander in the sink. Cook the soba noodles according to the package instructions. Do not go check your email. Drain the noodles into the colander with the cabbage, which will just wilt the cabbage so you don't have to blanch it in another pot and have an extra thing to wash. Rinse the noodles and cabbage with cold water and shake the colander to drain everything really well. This is important so the dressing adheres to the noodles. 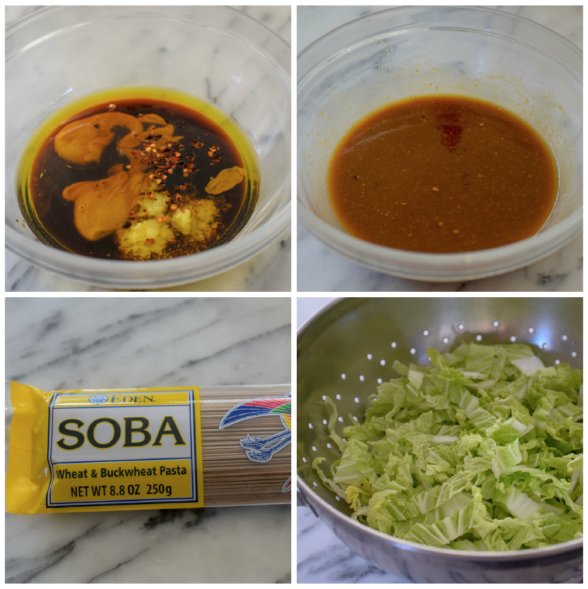 Transfer the noodles and cabbage to a serving bowl. Add the carrots, dressing and any additional vegetables you like and toss well. That is such an amazing idea! I don’t think chickpea pasta existed when I came up with this recipe. Love it! This was fantastic! I used coconut aminos instead of the Tamari/Shoyu and it was wonderful. So easy and delicious. Thank you! Any suggestions for peanut subsitute? You can use roasted cashew butter or tahini. Great recipe! Now a family favorite! We also added cooked tofu and only used 3/4 of the dressing and it was great! Thanks Pamela! Thanks for mentioning the tofu — it’s super yummy with this dressing! My son and I love chinese food. I made this for dinner last night and I could not believe how delicious it tasted! It was pretty easy to make. My son loved it. He asked if we could have this dish every night. I’ve entertained and served this fabulous dish a number of times. It’s so yummy! I add grilled chicken for extra protein! This looks so delicious, and is the perfect dinner for a meatless Monday! This is soooo delicious! It is my husband’s favorite! My kids love it with yummy snow peas and carrots, LOVE IT!